Families will feel safe-and full-in this big Grabowski. Chicago was long known as a city of “Grabowskis”—hardworking, hard-playing types who took pride in maintaining safe, welcoming neighborhoods. 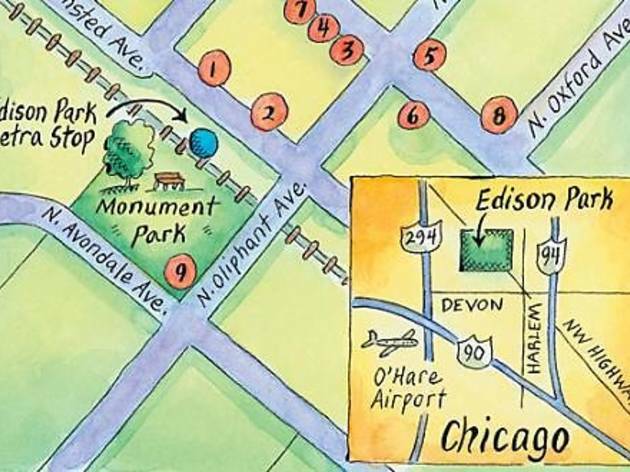 Far Northwest Side ’hood Edison Park embodies that tradition so well it gave us former Chicago Bear Jim Grabowski, the man who inspired the nickname. These days, police cars and other government rides park outside many of the brick bungalows lining narrow, tree-lined streets like Oleander Avenue. That’s because cops, firefighters and other city workers flock to Edison Park, which borders Park Ridge and marks the 100th anniversary of its annexation into Chicago next year. But the real charms here lie in the small commercial district packed with restaurants and attractions along Northwest Highway and Olmsted Avenue, with plenty of options to keep your family well fed and entertained. Kick off a day trip with lunch at venerable hangout 1. Moretti’s (6727 N Olmsted Ave, 773-631-1175), across the street from the Edison Park Metra station, where kids in soccer cleats make their own pizzas while Mom and Dad wash down sweet coconut-crusted onion rings with $7 martinis. Feeling more Lebowski than Grabowski? Head down the block to 2. Edison Park Inn (6715 N Olmsted Ave, 773-775-1404) and watch league play on eight vintage bowling lanes (there’s no open bowling, but you can book a party starting at $13 per person). Meanwhile, foosball tables and standard chicken-finger-and-pizza kiddie fare will keep the whole family happy. Continue rocking the nostalgia at Kaage’s Korner newsstand, which has hawked newspapers on the corner of Northwest Highway and North Oliphant Avenue for 66 years. ITALIAN NICE Edison Park’s family-friendly eateries include newbie Grazie and mainstay Moretti’s (below). “You can put roots down here,” promises proprietor Irvin Kaage, 81, as he greets customers pulling to the curb for a news fix. Kaage’s roots are showing just north of the newsstand at 3. Grazie Coffee Café (6700 N Northwest Hwy, 773-775-3312), where decades of his family photos grace the exposed-brick walls, and the after-school crowd gets wired on mocha frappes and Homer’s ice cream from Wilmette. “Edison Park’s a great place to grow up because it’s in the city but it’s got a suburban feel,” says barista Leah Marsden, 18, one Saturday morning while a dad plays board games with his two young kids at a back table. Leah’s father is a firefighter, as are the two entrepreneurs who opened Grazie last summer. Mainstay eateries on the strip include meatball-haven 4. Tony’s Italian Deli & Subs (6708 N Northwest Hwy, 773-631-0055), where you can chow down at one of the seven tables or order some ready-made pasta dishes for home and peruse the huge olive-oil selection and big wheels of Parmesan cheese while you wait. Then there’s fancier but still kid-friendly 5. Zia’s Trattoria (6699 N Northwest Hwy, 773-775-0808), which has comp valet service and a staff willing to plate plain old noodles and butter for picky eaters; and 6. Elliott’s Seafood Grille & Chop House Supper Club (6690 N Northwest Hwy, 773-775-5277). And don’t expect your stroller to draw dirty looks. “It’s such a family-oriented neighborhood, restaurants expect people to bring in their kids,” says Grazie manager Jaime Wagner. SHE’S CRAFTY Vicky Bellisario helps kids pimp out pottery at If An Elephant Can Paint. Portions are huge, and you’ll want to stop at 7. Conca d’Oro Pastry Shop (6710 N Northwest Hwy, 773-631-1962) afterward to munch on lemon dots and cannoli under the watchful gaze of a replica of Michelangelo’s David, so let the family work up an appetite at 8. If An Elephant Can Paint (6677 N Northwest Hwy, 773-467-4595), where owner Vicky Bellisario helps local kids and their crafty parents paint pottery which she then fires in a kiln housed in an old savings & loan vault. Kids also can work off steam at 9. Monument Playlot Park (6679 N Avondale Ave) by running around the black-and-white pillar honoring Army and Navy vets, or by exploring 10-acre Olympia Park (6566 N Avondale Ave), with its basketball, tennis and volleyball courts, football/soccer field, junior baseball diamond, spray pool and activity-packed fieldhouse. “When the weather’s nice, people just walk around and discover what’s happening in their neighborhood,” Bellisario says. It’s a Grabowski dream come true. Stop by during Edison Park Fest, August 14–16 (edisonpark.com). 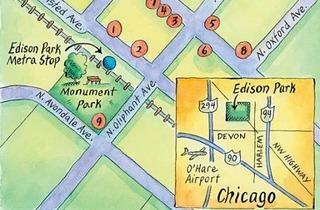 Plus, score more dining tips from our Edison Park Taste Quest.